Knowing that the Empoli Picture Gallery was founded just after the middle of the 1800’s is not a fact without importance, it means that the Museum of the Collegiate Church of Sant’Andrea is one of the most ancient of the ecclesiastical ones and perhaps for this reason is one of the richest of the minor Italian museums. “A true gallery of primitives” (old masters), such as “to arouse the envy of much larger cities”: as written by one of the most important art historians of about a century ago, it concentrates in a few rooms notable examples of the Tuscan school of painting, and especially, the Florentine one, for a period running from the 1300’s to the earliest years of the 1600’s. 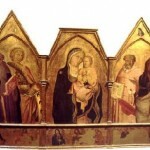 It begins with a series of gold backgrounds from the 15th century; triptychs or sections of polyptypchs coming from the adjacent Collegiate Church, or from other places of worship in Empoli, painted by some of the most important artists of the period: Agnolo Gaddi, Niccolò di Pietro Gerini, Cenni di Francesco and Lorenzo di Bicci. 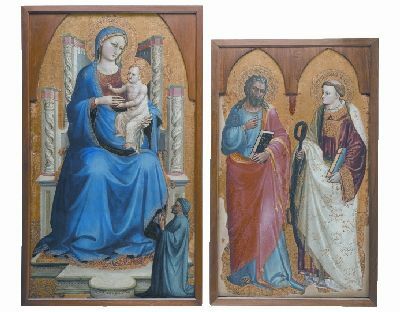 The room dedicated to the early 1400’s follows with two works by Lorenzo Monaco and a lovely small panel by Filippo Lippi, which was privately donated. 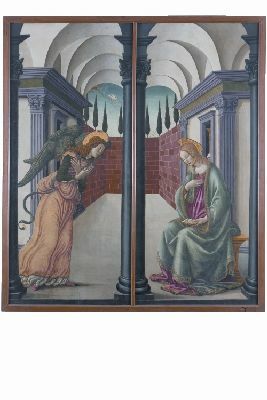 Of great impact, the adjacent hall and room are dominated by two Renaissance tabernacles, the first by Francesco and Raffaello Botticini, the second by only Francesco but enriched by Antonio Rossellino’s sculptures; on the remaining walls are arranged panels also by Botticini, or painted by Pier Francesco Fiorentino, Jacopo del Sellajo, Fra’ Paolino da Pistoia and Giovanni Antonio Sogliani. A 17th century work by Jacopo Chimenti, also known as Empoli, closes the chronological exhibition. Some significant exemplars of Della Robbia’s art are attached outside high up on the walls of the cloister. In addition, the milieu on the ground floor is particularly important. Formerly part of the ancient church of San Giovanni Battista, it was then transformed into the Baptistery, as the 15th century baptismal font attributed to Bernardo Rossellino shows; moreover,the detached fresco representing “Christ in pietà”, was relocated here. 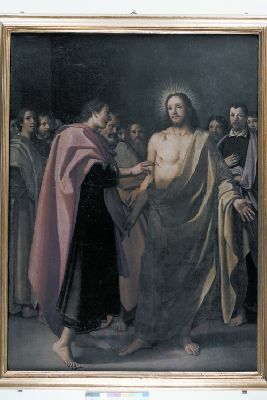 It was probably painted in 1425 by Masolino, who, in this work, was already acquainted with the artistic changes proposed by his celebrated pupil, Masaccio. Itinerari del Museo, della Collegiata e della Chiesa di Santo Stefano. Proto Pisani R. C., Firenze, Editori: Becocci/Scala, 1994. Size: 280 cm. x 118 cm. The composition unfolds around the axis of the Cross. 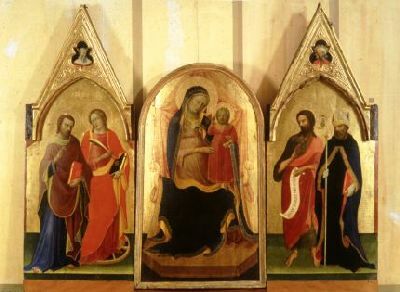 In the center is Christ, flanked by the Virgin and by Saint John. On the peak is the Holy Face between the prophet Isaiah, who predicted the coming of Christ, and the prophet Ezekiel, who received a vision of his death and resurrection. 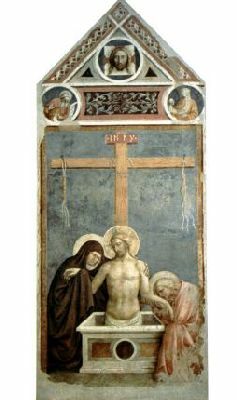 One notices the signs of innovations in Florentine painting at the beginning of the 15th century: the perspective of the sepulcher, the ropes on the arms of the cross, the solidity and luminosity of the figures fully show Masaccio’s influence. Size: 240 cm. x 125 cm. The local chronicles relate that, during the 1518 Corpus Domini procession a Jewish moneylender, was accused of having thrown trash on the tabernacle of the Sacrament. The alleged culprit was given a fine of ten gold florins destined for the construction of a public tabernacle depicting the Virgin. Size: panel 280 cm. x 275 cm. ; Sebastian: 155 cm. ; angels: 57 cm. 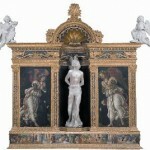 This altar device was commissioned by Giovanfilippo Capacci and his mother who chose Saint Sebastian, the protector against illnesses, to commemorate relatives who had died in the plague. 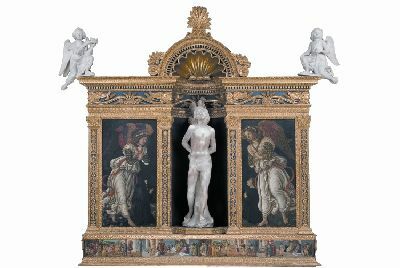 This work enjoyed great fame, especially thanks to the union of sculpture (Saint Sebastian and the two angels on the cresting) and painting (the angels with the kneeling donors in the side panels and the predella with the stories from the life of the saint). Size: 28 cm. x 54 cm. Together with other elements, it was part of a predella. The whole work made up a large altar device modified during the modernization of its original chapel in order to allow the single parts to be used differently. Size: 137 cm. x 182 cm. 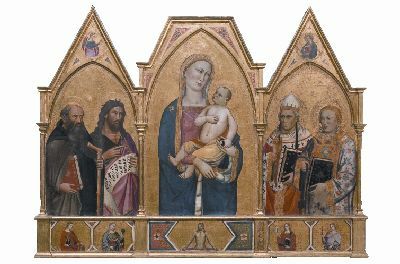 The polyptych is practically whole, lacking only the central peak where a benedictory Eternal Father was probably portrayed. 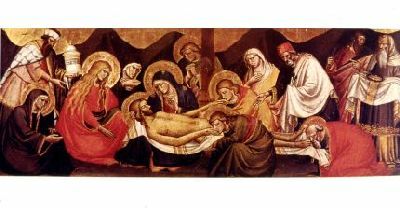 On the peaks are the announcing angel and the Virgin of the Annunciation; on the predella, Saint Catherine, Saint Reparata, Saint Barbara, Saint Margaret surround Christ in Pietà. 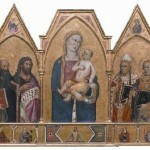 The structure of the central Madonna and Child recalls famous examples by Giotto, while the saints to the sides, pensive and less expressive, reflect the archaic types of Andrea Orcagna. 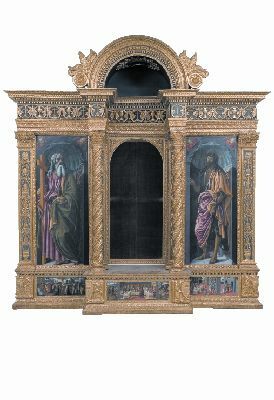 Together with other elements, it was part of a predella and the whole work made up a large altar device modified during the modernization of its original chapel in order to allow the single parts to be used differently. Size: 157 cm. x 197 cm. 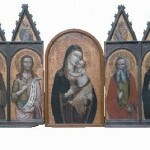 The Madonna and Child at the center of the painting appear like an icon among the saints who surround her. 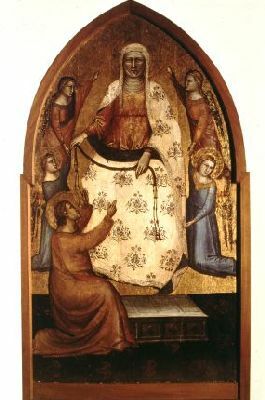 Posed on a finely decorated cushion in place of a throne, she appears there as the Madonna of Humility, a theme of Sienese origin that stresses the devotional and domestic tone of the sacred image. Next to her are Saint Domninus, the titular saint of the church of provenance; Saint John the Baptist; Saint Peter; and Saint Anthony the Abbot, identified by the inscription that runs along the base. Size: 79.5 cm. x 54 cm. The relief is on a slate background. It was trimmed in an undetermined period, perhaps in order to remedy damage to the neutral background: one sign of this modification is the Child’s lack of a halo and the irregular cuts on the lower corners. 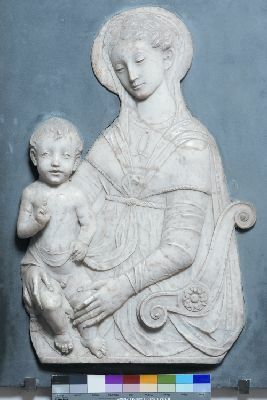 The surface treatment, skillfully modeled in the passage from stiacciato to full-relief, makes evident his training in the Donatellian style, enriched by the artist’s study of antique statuary. Size: 400 cm. x ca. 360 cm. The central niche has an opening where the “Tabernacle of the Sacrament” was set. The tabernacle was removed in 1623 with the modernization of the main altar. 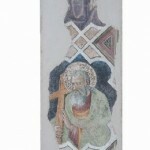 Saint Andrew and Saint John the Baptist are portrayed at the sides. On the predella, the martyrdom of Saint Andrew is to the left, with the martyrdom of John the Baptist to the right. 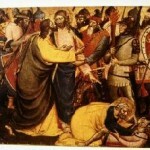 The tripartite scene in the centre shows the Last Supper between the Arrest and the Agony in the Garden. Size: 121 cm. x 45 cm. 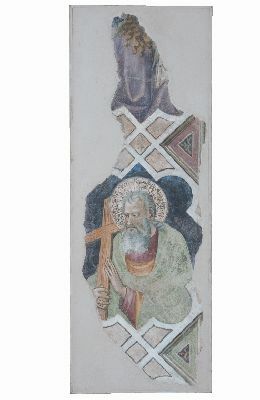 This fragment, together with the one portraying Saint John the Baptist and Saint Peter, comes from the Chapel of the Purification in the Church of the Agostiniani. Hidden under a layer of plaster added during the church’s 18th-century renovations, they were recovered in 1943. They bear important witness to Florentine painting between the 14th and 15th centuries. Size: 36 cm. x 121 cm. 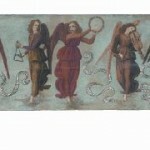 This elongated panel could have been part of an ecclesiastical musical instrument, as the subject portrayed also illustrates a dance of angels equipped with scrolls in which the verses from Psalm 150 are inscribed. Together with other elements, it was part of a single predella. The painting made up a large altar device modified during the modernization of its original chapel in order to allow the single parts to be used differently. 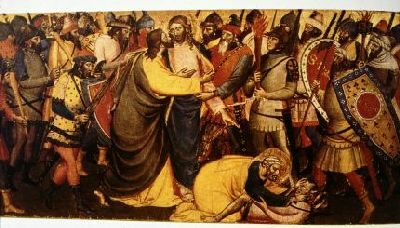 The present scene is very lively: a crowd of soldiers in colored uniforms, helmets, swords and lances, gathers around the main personage. Size: procession and miracle 29 cm. x 86 cm. ; pax board: 29 cm. x 103 cm. The three small panels were the step of the old altar of the Chapel of the Santissimo Crocifisso. 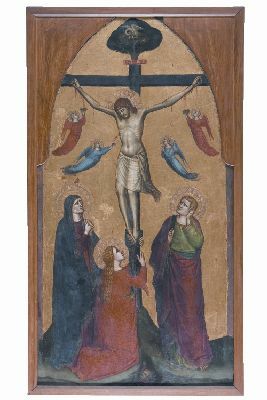 The iconography recalls a miraculous fact that took place in 1399 when the brothers of the Company of the Crucifix, on a pilgrimage to Val di Marina to pray against the plague, leaned the crucifix against the trunk of a withered almond tree that then blossomed. 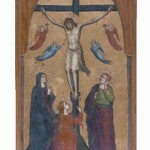 On the left, the brothers’ procession is depicted; in the centre is the miraculous moment, with the return of the Crucifix on the right. Size: 111 cm. x 191 cm. 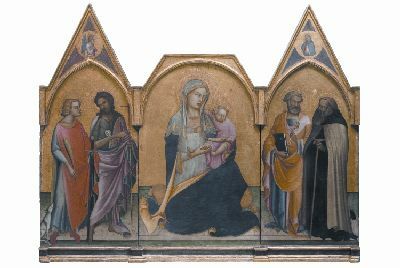 The polyptych’s central panel is devoid of its original carpentry and cusps, separated from the side panels following an intervention carried out at some unknown time. 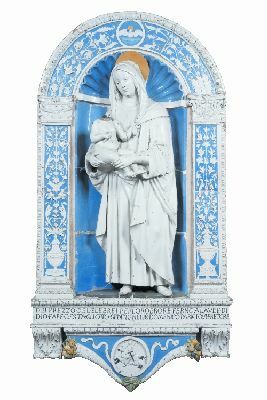 Although the side panels were placed in the museum, the Madonna remained in the Collegiate Church until 1956, when the work was reassembled. The polyptych is an eccentric variant of Giottesque culture characterized by a marked expressionism and by a dynamic vividness of color. Size: 140 cm. x 76 cm. 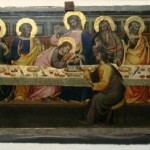 This panel painting is the center part of a dismembered polyptych. Although compromised by modifications and the damage suffered over time, the work shows a remarkable skill of execution in the varied elegance of the fabrics’ decorations and in the workmanship of the gold parts. Size: central panel: 124 cm. x 72 cm. ; side panel: 110 cm. x 66 cm. 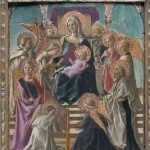 Missing its left side, this polyptych depicts the Madonna sitting on a richly decorated monumental throne, being worshipped by the purchaser kneeling in the lower right. 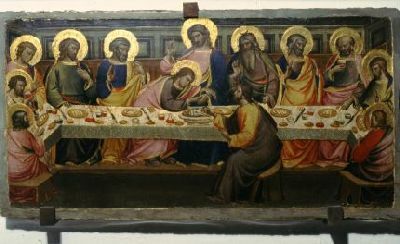 Identified as Simone di Guiduccio from Spicchio, he commissioned the work for the Chapel of Saint Leonard in the Collegiate Church. In the painting the colors’ luminous refinement, the careful execution of the gold decorations and a knowledgeable perspective and spatial sense stand out. 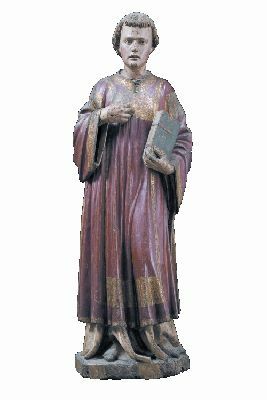 The 1935 restoration removed a layer of white, used to simulate marble, thus permitting a full recovery of the very sophisticated polychrome of the robe and face. 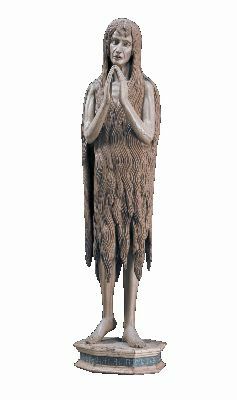 The figure’s structure was conceived for a frontal view but the position of the feet and arms give it a delicate movement. The execution of the face is particularly skillful, showing a delicate rosiness that barely flushes the cheeks. Size: 186 cm. x 136 cm. 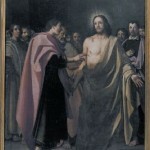 The composition shows with great clarity and simplicity the moment of the meeting between the Risen Christ and Saint Thomas. Rendering the atmosphere even more intense is the lack of interior details and the choice of a dark background. The use of light highlights the surface qualities, the substance of the fabrics, and the lifelike flesh. The two figures that close the group, their gazes turned towards the onlooker, are the portraits of the purchasers. 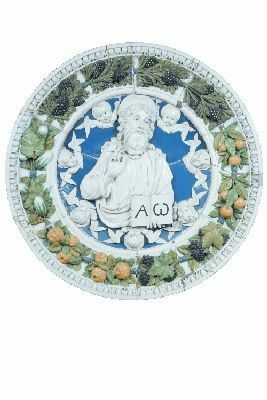 The fruit swag that acts as a frame to the image is a kind of distinctive element of the della Robbia workshop. Thanks to the material’s ductility and its particular way of being worked, this decorative motif drawn from classical art was transformed into very lively accompaniment to the images. Size: each panel: 190 cm. x 92 cm. 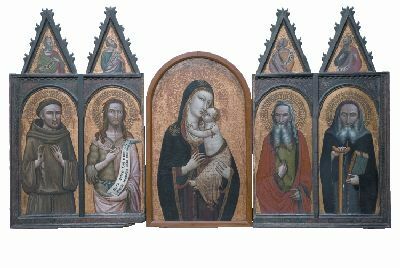 The two sections, now reunited following restoration, may have acted as the panel-doors to an altarpiece or a tabernacle, as indicated by the central column that serves to mark the space while, at the same time, unifying the scene. The holy event, framed within a structure beyond which a very clear sky appears, depicts the angel and the Virgin with elongated, thin figures and faces framed by full heads of hair. Size: 128 cm. x 68 cm. This is the center section of a polyptych made for the Chapel of the Cross that was dedicated to Saint Helen. To the sides of the Crucifixion there were formerly two panels, now lost, that depicted Saints Augustine, Nicholas, Andrew, and Julian. The panel is distinguished by the remarkable technical qualities of the decorations and the workmanship of the gold backgrounds. Size: 129 cm. x 180 cm. The refined execution of this splendid panel painting immediately stands out: the richness of the robes of Saint Catherine and the Child, the delicate ornamental motif that outlines the edges of the mantles, and the delicately graduated chromatic range in contrasting warm and cool tones. The central peak is missing. 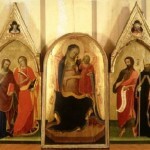 Unfortunately, there are many gaps on the predella that shows Christ in Pietà between the Virgin and Saint John the Evangelist and four saints. Size: 105 cm. x 56 cm. 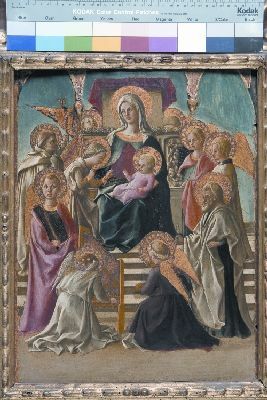 The small altarpiece bears a Crucifixion on the peak while the Madonna in the center panel, adored by a retinue of angels, suckles the Child who is holding a small bird in his hands. The painting is attributable to Ambrogio di Baldese, a painter stylistically close, in an early phase, to Niccolò Gerini, but later attracted to the more modern results of Lorenzo Monaco’s art. Size: central panel: 101 cm. x 58.5 cm. ; side panels 132 cm. x 54 cm. 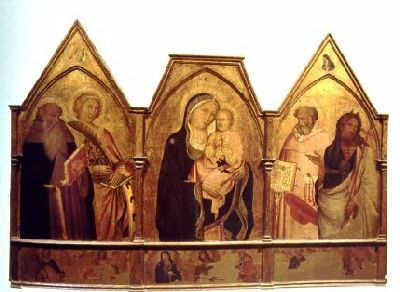 These panels have had a different sequence of collecting events that brought them at different times into the Empoli collection. 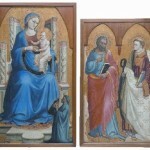 Information regarding the fact that the two side panels were part of the same triptych together with the central panel is uncertain: the composition is the result of the 1956 reconstruction. 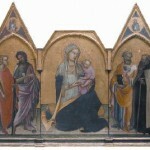 The central panel is attributed to Lorenzo Monaco, and the side ones to his workshop. The figures of Moses and of a prophet on the peaks have been referred to Paolo Schiavo who was trained in the friar’s circle. Size: 43.7 cm. x 34.3 cm. 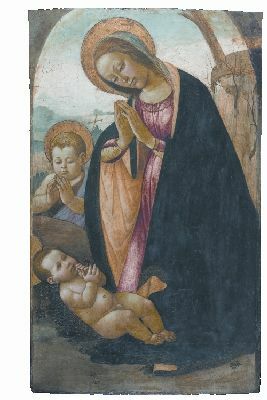 Donated by Carlo Romagnoli, this small panel is one of the masterpieces in the Empoli collection. 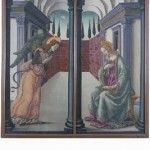 The scene’s depth, underlined by a flight of stairs and culminating in the Virgin’s throne and the two angels kneeling in the foreground, is to be noted. Below the current 17th-century frame, the marks of the original arched structure that enclosed the painting are seen. Its removal resulted in the cut on the upper part. The sculpture immediately evokes one of the most famous Renaissance masterpieces: Donatello’s Magdalene. The work, attributed to Neri di Bicci, with Father Romualdo of Candeli assisting in the carving, is characterized by the rigid, gaunt figure and the thin, sharp features, emphasized by the brush-drawn wrinkles. Size: 98 cm. x 60 cm. 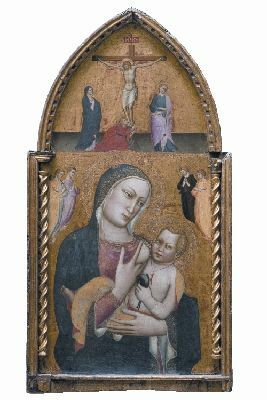 Attributed to Jacopo del Sellaio, this small panel is clearly a painting for private devotion, both because of its size and its subject. The Madonna is absorbed in prayer before the Child, in a very intimate way. 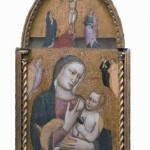 This iconography enjoyed remarkable success in Florentine painting from the second half of the 15th century onward. By car: coming from Florence, take the SGC FI-PI-LI (towards Pisa) and exit at Empoli Est. By bus: from Florence (Piazza Adua), use the LAZZI-SITA bus service. By train: local trains leaving for Pisa and/or Livorno from Florence’s S. M. Novella railway station stop at the Empoli station. Tuesdays-Sundays: 9 a.m.– 12 p.m.; 4 p.m.– 7 p.m.